Six men are on trial accused of conspiracy to murder and conspiracy to cause explosions in London on 21 July 2005. All six deny the charges. For a few hours on a bleak mid-winter's day those gathered in Woolwich Crown Court were transported back to the dramatic events on a sweltering afternoon in July 2005. A succession of witnesses were shown CCTV footage taken from within the Northern Line carriage and inside the Oval Tube station. All had been passengers or were London Underground staff who by a fluke of timing were thrown together on that day. The witnesses were a cross-section of multi-cultural London and each one reacted differently when Ramzi Mohammed allegedly detonated a home-made bomb. First up was firefighter Angus Campbell who strode confidently into the dock to give evidence about how he had confronted Mr Mohammed. Mr Campbell recalled his state of mind moments before the incident, saying: "I was sitting down and watching the woman opposite me. "She had a small child in a buggy and he was being quite lively and I was mildly amused. I have small children and I often struggle with my own." The jury listened as Mr Campbell watched CCTV footage in which he wore a white T shirt, shorts and sandals - evoking the warmth of that July day. He said there was suddenly a "loud explosion" and he recalled that "my first memory was being cowed. I was crouched in my seat and I remember my arm being over my head. "The woman opposite was screaming and Mr Mohammed was shouting and screaming and there was an awful lot of smoke in the carriage," he said. He said his first instinct was "to run away" but instead he helped the woman, Nadia Baro, out of the carriage before returning to Mr Mohammed. He shouted to him "What have you done, what have you done?" Junior prosecuting council Max Hill asked: "Did you get a response from him?" Mr Campbell hesitated and then said "Yes. 'This is wrong, this is wrong'". 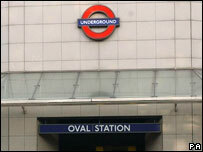 As the train continued towards Oval Mr Campbell said he and Mr Mohammed engaged in a shouting match. The firefighter admitted he had been "quite vociferous" and had sworn a lot. Mr Mohammed, wearing glasses and a smart suit and blue tie, made assiduous notes as the next witness took the stand. Looking nervous and ill at ease Mrs Baro began by recalling how she was busying herself with her nine-month-old son and was preparing to get off at Oval when she heard a bang. "I noticed the person next to me had a rucksack and something came out of the rucksack and fell on the floor," she said. She said she was keenly aware of what had happened on 7 July and admitted she went into "a panic". She said she noticed "an oily smell" and added "I was in such a panic because I didn't know how bombs worked and I thought we were all going to die now". When the train arrived at Oval, an antiquarian book seller, Arthur Burton-Garbett, took up the narrative. The sprightly 72-year-old said he had fired ammunition when he was in the Army and thought he recognised the smell on the train as cordite. "Then I tumbled that it was a detonator," he said. He said he got off the train and shouted "Stop that man, get the police!" Mr Burton-Garbett then chased the man who he said ran "like an express train" up the down escalator to street level. Royal Opera House employee John Campbell said he had tried to trip up Mr Mohammed as he ran along the platform. Retired engineer George Brawley said he felt "morally obliged" to try to grab him as he sped past "like Linford Christie". But he added: "I grabbed his forearms but he broke free without breaking step." Station supervisor Victoria Abdulai said Mr Mohammed brushed past her at the top of the escalator. And flower seller Ralf James said he followed him outside the station and saw him disappear down Camberwell New Road. 21/7: Was it linked to 7/7?